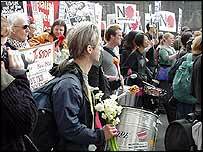 Thousands of peace campaigners have marched through the streets of central London in protest at the continuing war in Iraq. The Stop the War coalition believes public opposition to the conflict is still strong - in spite of scenes of jubilation this week as American tanks entered Iraqi cities. Organisers say between 150,000 and 200,000 people marched through the capital, but Scotland Yard estimated that 20,000 people took part in the rally at Hyde Park - the final meeting point for protesters. Former Pakistani cricket captain Imran Khan - who joined the march - said the numbers were irrelevant. "It doesn't matter how many people turn out, it's about registering a protest that a principle has been violated, international law has been violated and everyone who cares must register a protest," he said. 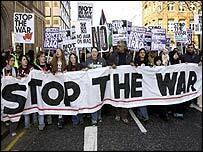 Hundreds of anti-war protesters also took to the streets of Glasgow, in a march organised by the Scottish Coalition for Justice not War. The London rally, which started at Victoria and Waterloo stations and followed two routes through the city converged on Parliament Square on Saturday afternoon, where a two minutes' silence was held "for the war dead". Marchers laid flowers, cards, wreaths or whatever they felt appropriate at the barriers erected outside Downing Street as they walked past. From Parliament Square demonstrators then progressed through Trafalgar Square, Haymarket and Piccadilly to attend a rally in Hyde Park. Speakers included MPs Tam Dalyell and George Galloway, who face having the Labour whip withdrawn because of their anti-war stance. The march, called by Stop the War with the Muslim Association of Great Britain and CND, is the third mass London rally to be held. On 15 February, more than one million people took to the streets of London to protest against the then looming war on Baghdad. Labour MP David Winnick accused organisers of "hijacking" public feeling against the war for their own ends. "I don't doubt the sincerity of most of the peace marchers who marched before and those who, for some reason, march today," he said. "But the fact remains that there are a number of the leading organisers whose commitment to parliamentary democracy is very remote indeed." In response, Andrew Burgin, a spokesman for The Stop The War Coalition said: "David Winnick should show some concern for the people of Iraq and what they are being put through rather than trying to score cheap political points. "The Stop The War Coalition is a broad-based coalition of people who are opposed to the military occupation of Iraq and the terrible chaos that is being created by this illegal invasion." "We have come here to pay our respects to the thousands of Iraqis who have lost their lives"
Anas Altikriti, of the Muslim Association of Britain, said the mood among protesters had changed since the first anti-war march in the capital in February. "The pre-war anti-war demonstration was more jubilant," he said. "People are now more angry that we have committed what they see as a crime, an illegal occupation, and that people continue to suffer away from the media spotlight. "This war is wrong and it never became legitimate." Anti-war campaigner Chris Nineham said he believed "a great deal more problems" lay ahead for the British and US forces as they tried to take over Iraq's administration. "I don't really believe the fighting is over - I think the invasion is sliding into a colonial occupation," he said. "Every day for the last week, innocent Iraqis have been shot by US and UK troops. "Unfortunately the people in the Pentagon have made it clear that they want to extend this war into a list of other countries that they want to take on - including Syria and Jordan and Iran. "We are demonstrating because we don't want that to happen." Scotland Yard later said a total of three men were arrested during the rally at Hyde Park. One was arrested for an alleged common assault, another on suspicion of possessing cannabis and a third for suspected immigration offences, police said. On Saturday, protests against the war also took place in around 40 other countries, including New Zealand, Japan, South Korea, and Greece. One of the biggest was in Rome, where an estimated 110,000 people took part, while around 10,000 were out on the streets of Paris. In New York, Sara Flounders, co-director of the International Action Center said: "It's more urgent and more important than ever that there be a mobilisation. Only now the focus is, 'No' to colonial occupation," she said. "Those at the rally in Hyde Park are convinced that the prospect of war elsewhere is still present"